Some months ago, while in India, I went up into the mountains. On a late afternoon, following a walk in the forest, with the day clear and the sun still strong, I came to a café and sat in the open. All around the pines were dark, and there was snow in them, you could see how light tussled to touch the snow that shone very white in the checkered shade. In front, at some distance, stretched from far north down into the east the glacial arc of the Himalayas separating me from Tibet, while to the right, up close, was the snow-covered flank of a forested ridge from where the intermittent cawing of ravens fed and deepened the silence. High above, on icy drafts, roamed majestic the great Himalayan eagles. I had in my jacket pocket a conveniently sized old copy of J.M. Coetzee’s Disgrace that I was returning to exactly a decade later. Suddenly, from amid the trees emerged my friend, and past him, still in the forest, rose the murmur of two familiar voices. The moment he settled next to me, I thrust into his hands the book opened at the page I wanted him to read. We had read the novel around the same time, and neither of us had revisited it until now. My friend read with total absorption for a full minute, and then closing the book and looking up said what I knew he would say, ‘Didn’t remember this at all.’ But it was the way he said it that told me we were, at once, thinking of another, older conversation. A few years previously, the two of us had driven into the vast silences of Spiti valley, a cold desert on the edge of Tibet. But at the beginning of the journey, so to speak, our progress was halted just under the first of the three high passes we had to cross on our way into the valley. It had been snowing for two days in the height of summer, and men were working up on the pass to clear the way. To avoid returning to the town below in order to get a head start next morning, before the path turned to slush from the passage of held up lorries and required more work and time, we decided to spend the night in a peasant’s shack owned by a makeshift tea stall owner who gladly swindled us for this hospitality. We grudged him nothing, for at such height earning opportunities are as scarce as a roof over your head. But now it was still day, and we were sitting on the edge of a ridge, thirteen thousand feet high, sitting still, absorbing our environment. Sheer rock faces of stone and ice surrounded us in a horseshoe formation at whose bottom were green wooded valleys and hanging pastures with white dots that were suddenly sheep and slim waterfalls opening into so many mist-fans in their layered drop through air and crag. ‘What,’ I had then asked him, ‘is there in us that responds to this scene? And what precisely is the quality of this response? Does it overwhelm us with its magnificent scale or because we have somehow carried and transmitted the archetypal image of this scene across ages, some kind of slow and latent conditioning?’ I may well have been thinking of the Jungian unconscious or the Kantian notion of ‘sublime’ or an amalgam of the two. But his response was sharp and disappointing. ‘Conditioning,’ he said. ‘Plain and simple. Of the worst kind.’ And then I turned to where he had been looking and I saw it too. A fresh batch of tour buses and taxis had landed at the barrier behind us, and men, women, and children were pouring out of them in their colourful, rented snow suits, posing for photos, flitting about, restlessly taking in the scene, sporadic vents of brief joyous eruptions. But already there were others who had had their fill of snow and cold and headaches, and were getting into their vehicles to return to the town below, leading to ever more hooting of horns, congestion, and death-scares. But even then I knew that it was not solely my friend’s response that had disappointed me, just as it was not the rising commotion of tourists that had made him speak so. Something else was happening. The scene, there in all its timeless splendor, was already leaving us. The mountains and valleys were exhibiting themselves exactly as before, and yet we felt that they were turning away from us. An invisible yet certain veil was falling over everything that instantly excluded us. That never more could be. Usurpation is one of the deeper themes of the Alps sequence. The great archetypes of the mind, pure ideas, find themselves usurped by mere sense-images. . . . The question is not, How can we keep the imagination pure, protected from the onslaughts of reality? The question has to be, Can we find a way for the two to coexist? . . . As the sense-organs reach the limit of their powers, their light begins to go out. Yet at the moment of expiry that light leaps up one last time like a candle-flame, giving us a glimpse of the invisible. . . . Wordsworth seems to be feeling his way toward a balance: not the pure idea, wreathed in clouds, nor the visual image burned on the retina, overwhelming and disappointing us with its matter-of-fact clarity, but the sense-image, kept as fleeting as possible, as a means toward stirring or activating the idea that lies buried more deeply in the soil of memory. It is this balance between the sense-image and the pure idea that language, at its best, achieves. Destined to be a bridge between the two at its peak, it is also this very Midas touch of language that turns anything it so much as caresses into fiction. Fiction, of course, not in a superficial, everyday sense, but rather in a deeper, more philosophical one. This ‘peak’ of language is not some stylistic register, or only partially, and in any case is an effect not a cause, a case of total truthfulness to one’s material and utmost clarity of expression, the simplest and deepest way to express the material at hand. And here lies the paradox: where one aims for complete truthfulness and clarity in expression, there are the seeds of fiction sown. For instance, I have persevered to describe the two different scenes above, one more recent than the other, in precise detail, leaving out all extraneous material, going straight for the thing in all its facticity. Yet it seems to me that it is this perseverance, this exactitude of description, this selectivity on my part, that makes what I have written above resemble fiction, indeed turns it, very likely, into fiction. This may well be the supreme quality of language. I am aware there are ethical considerations involved in this line of inquiry, but given that we are dealing with psychic phenomena and not outside events where language has, generally speaking, a functional character, I can well assure that those who go down this path will be the better for it. (For one, to see the world and, consequently, our manifold desires arising in and through it acquire the quality of fiction through language is to be humbled and, at least partially, made free of such desires. Continual thinking along this path may well lighten our tread, which would be of immense benefit to our ailing planet). Gradually improving one’s ability to handle language, aiming for precision and simplicity, is to ascend (or descend) steadily through levels of consciousness, is to be on that (b)ridge from where the sudden unveiling of the summit of Mont Blanc would be not a cause of grief but of joy. Man may be the maker and consequently a prisoner of language, but that prison has no door, or rather the door is forever open. Music or painting or the plastic arts too perhaps have their respective especial languages in the realm of the psyche, but it is only in words that the senses of sight, sound and – why not? – touch combine, for they are at once more real and more abstract, connecting mind to matter in their inmost being. Needless to say, in every language and every literature of the world, there must be countless examples of this heightened use (and experience) of language. It is possible, for instance, to read from end to end (and marvel besides) Cormac McCarthy’s gruesome novel Blood Meridian, because the environment in which it unfolds is constructed from a language that is perpetually at the frontiers of conscious experience. 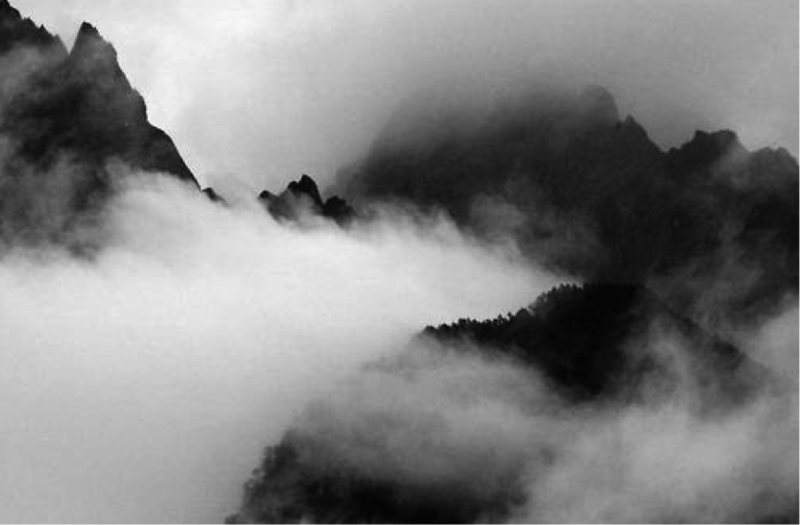 The valleys are lost in cloud and mist that thins as it billows across mountain slopes and trails out over ridgeline hollows. . . . Dragon’s dynamic life usually remains hidden here, because its movements take place only across geological time spans. But as I watch summits roam empty expanses of mist, ridgelines breathing in and out of view, dragon seems everywhere rippling and writhing in these mountains. . . . Small as a silkworm and vast as all heaven and earth . . . dragon descends into deep waters in autumn, where it hibernates until spring, when its reawakening means the return of life to earth. It rises and ascends into sky, where it billows into thunderclouds and falls as spring’s life bringing rains. Its claws flash as lightning in those thunderclouds, and its rippling scales glisten in the bark of rain-soaked pines. It can rear up into a mountain, surge in scrawled ridgelines stretching away blue through broken mist and cloud, or cascade in tumbling streamwater. It can clench itself into a beating heart, or twist in a sudden turn of thought. Appearing, then disappearing, only to reappear in another form of hunger, Presence seething through Absence, Absence through Presence – dragon moves, all sleight of hand shimmering in and out of view. I have quoted Hinton at length not only to show the breathtaking beauty of the prose, its artistry and depth and technical finesse, but to grant an impression to the reader of the total fusion (and dissolution) of an archetypal idea with (into) a sense-image. First, language transforming the world into fiction, and then fiction opening a dialogue between presence and absence, and finally presence snuffing out into absence. One cycle is complete so that, once the dragon has redrawn breath, another may begin. In one of the poems by Tu Fu (or Du Fu), a favourite of mine, the poet’s presence opens out to encompass the entire universe – from the remote and glittering forest of stars to the new moon recently risen above faraway cold mountain passes right up to the chrysanthemum blossoms fallen near his feet in the yard – and by this virtue alone dissipates into absence, permeates it, is and is not. The translation below by Hinton is from the collection Mountain Home – The Wilderness Poetry of Ancient China. blossoms clotted there with swollen dark.